Attention Deficit Hyperactivity Disorder (ADHD) is one of the most common childhood disorders right across the world. It is also one of the most misunderstood. Myths that ADHD is caused by sugar or by bad parenting and shrill headlines claiming that the disorder is simply a confection cooked up by big pharma to peddle drugs to kids all add to the confusion. Stuart Passmore is a psychologist in private practice. He has developed an evidenced-based Parent Management Training program for parents of children with behavioural disorders ranging from ADHD to Oppositional Defiance Disorder to Conduct Disorder and children with explosive and non-compliant behaviours. Stuart also conducts professional development training workshops on Parent Management Training for behavioural and anxiety disorders. Question: Who did you write The ADHD Handbook for? 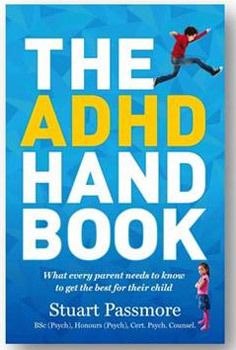 Stuart Passmore: This book was written to help and support parents who manage their children with ADHD. It was written to give them understanding and hope. It was written for schoolteachers to help them understand what the disorder is and how to best manage ADHD behaviour in the classroom and the most successful ways of teaching children with ADHD. It was also written for the professional to help them understand what it is like for the child living with ADHD and just how tough it can be for parents who face the difficulties day after day. Question: What do you hope readers take away from The ADHD Handbook? Stuart Passmore: First and foremost to understand that ADHD is a real disorder that is not caused by sugar, or diet or parenting styles or that it is not a new disorder. ADHD is a neurological disorder with very real causes. I have seen many, many parents over the years who are scared, confused, hurt, embarrassed and sometimes angry when their child receives a diagnosis of ADHD. The ADHD Handbook provides parents with the kind of information they need to make informed decisions, to know what to expect when they approach professionals seeking help and support. That's why there are dedicated chapters that describe in detail the diagnostic process, what is involved, what assessments are used and why and who should be involved in this process. There are chapters dedicated to the most effective therapies and one of the most scariest and controversial topics of all - medication. Question: Why is ADHD one of the most common childhood disorders? Stuart Passmore: I'm not sure that it is one of the most common childhood disorders. For instance, learning disorders, reading disorders, conduct disorder, oppositional defiance disorder and separation anxiety just to name a few, all affect children at about the same rate as ADHD. I think the issue is that we often hear very negative reporting of ADHD far more than we hear of any other childhood disorders and this is likely because people just do not understand the disorder. Stuart Passmore: We know ADHD is a neurological disorder. Through using medical imaging such as MRI and FMRI we can see there are five regions of the brain that are smaller and less active in the brains of people with ADHD. These regions of the brain are responsible for controlling, emotions, memory, attention and impulsive behaviour to name a few. The very symptoms we see in ADHD.
. Question: How can ADHD be treated? Stuart Passmore: We must understand that as a neurological disorder, just like Alzheimer's disease or Parkinson's disease, ADHD cannot be cured. ADHD is diagnosed as mild, moderate or severe. So therapy may in part depend on the severity of ADHD. We often hear horror stories that every child with ADHD is medicated and this is simply just not the case. The ADHD Handbook discusses in detail all the recognised therapies that are an effective treatment for ADHD. There are many available treatments and one of the most common is a multimodal approach. Simply, a professional will take into every area the child might be struggling with such as struggling at school, making and keeping friends, parent-child relationships, and behavioural concerns and offer a combined approach to address each of these issues. Also, parents might undertake a parenting program so they can get the help and support they need as well as learning effective ways of disciplining their children who very often push the boundaries. Question: How will this book empower parents? Stuart Passmore: Knowledge is power. My intent was to provide parents as much information as I could about the disorder, what causes the disorder, how it is diagnosed, what they might expect during the diagnostic process and who should and who shouldn't be involved in diagnosing ADHD. the ADHD Handbook addresses the common myths about the disorder, available therapies and a frank discussion about the different types of medications. Then there are chapters dedicated to children talking about the disorder and what it is like for them and their experiences on medication. Having this knowledge gives parents the power to make informed decisions about the best course of action for their child, to choose appropriately licensed and trained professionals to support them. Parents are taught about the different medications available for their child and what's good or bad about them. Parents will learn how to engage professionals instead of being a passive recipient, and to avoid those individuals who are not appropriately licensed or experienced in treating ADHD.